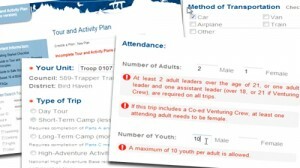 The new Tour and Activity Plan officially replaced the old Tour Plan on May 10, 2012. An informative training video has been developed on how to use the new Tour and Activity Plan application. It can be found here. The Tour and Activity Plan FAQ page can also be viewed here. Please contact the Central NC Council with any questions or concerns. If you need to file a Tour and Activity Plan, please remember you need to do so 21 days (3 weeks) before the unit activity takes place. If you do not already have a MyScouting accounting (you may have created one to complete online training such as Youth Protection), you will be prompted to create a user name and password before you can use the online Tour Plan system.